Watch out QVC, because the largest online retailer is moving into TV based shopping. Amazon is adding the ability to shop their massive selection of products using the Amazon Fire TV and Fire TV Stick. Anyone familiar with Amazon probably saw this coming, but now it’s finally being added to Fire TV devices via the new software update that is currently being deployed, and yes, you will be able to shop using voice search. A trusted source at Amazon, who wishes to remain anonymous, told me about the new feature months ago and I have been able to confirm its presence in the latest software update by decompiling and examining the source code. Also included in the new update, which is a necessity to effectively shop Amazon’s massive product selection, is the addition of filtering and sorting options to the Fire TV’s search functionality. Similar to how the X-Ray feature was covertly added to Fire TV devices a few months ago, the new shopping feature is already included in the Fire TV 51.1.6.0 and Fire TV Stick 54.1.2.0 software update that is currently making its way out to devices. However, you wouldn’t know it, because it is in a dormant state waiting for Amazon to remotely flip the switch that makes it available to customers. This allows Amazon to pre-load Fire TVs with the new feature over time, like they have been doing for a week now, and instantly make it available to everyone simultaneously. The only indication that the new shopping feature has been added is the addition of line “and shop purchases” to the description of the Fire TVs parental control PIN option for purchases. Amazon is also adding much needed filtering and sorting options to the Fire TV’s voice and text search functionality, which will support the new shopping feature. When searching for products, movies, TV shows, and apps you will now be able to sort results by relevance, best selling, price, and user reviews. For apps, you will also be able to sort by release date. There will also be search filters like the ability to select one of Amazon’s departments when searching products or selecting a controller type, game controller or remote, when searching apps. When viewing a search result, you will be able to press the Fire TV’s MENU button to bring up filtering/sorting options and you can press the REWIND button to clear them. In addition to filtering/sorting, I’m told you will be able to save searches, but I don’t have any information on how exactly that will work. 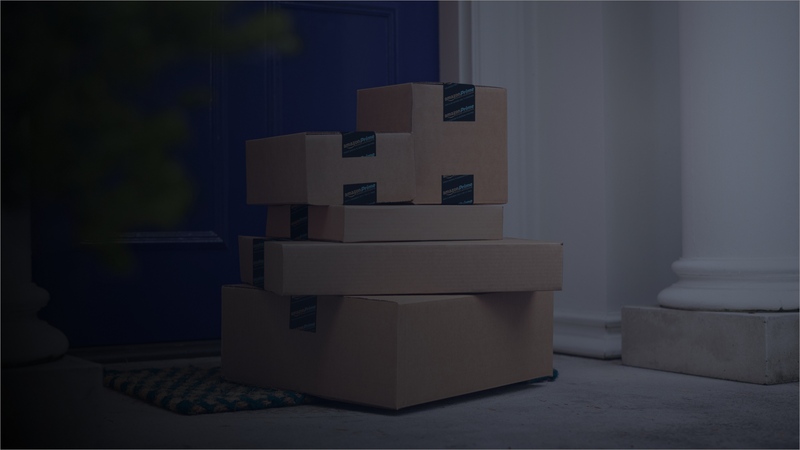 The new shopping feature may be made available to customers in conjunction with Amazon’s “Prime Day“, coming July 15th, in celebration of the company’s 20th birthday. So… About that Audible Audio tab on the Fire TV, again? Could you show additional proof that this is coming other than your anonymous source? Not to be rude, but I’d just like to see the source code you decompiled. Sure thing. I probably should have included these in the main article somewhere. List of Fire TV menu items showing new shopping menu added. New shopping app added to source. New instructions for the new search sorting and filtering. 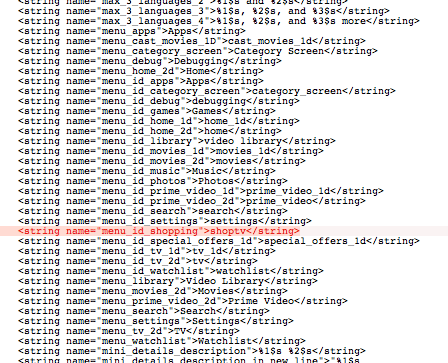 Additionally, the latest update file, which can be downloaded from Amazon here includes the new shopping app called MShopAndroidTVClient-1.0.apk in the /system/app directory. You can also find the app’s Fire TV background image here hosted by Amazon. Note the “ShopTV” in the URL. WOW devs at amazon are getting sloppy. I bet someones going to get a stern talking to tomorrow. Slow it down, double check your codez. Sorry, but that will never happen. We discuss it in the latest podcast episode, but the jist is a browser on a TV is a poor user experience that takes away control. But I agree w/ AFTV’s comment below that Amazon probably does not want to revisit or recreate the days of MSN TV / WebTV, 3Com Audrey, or i-Opener (thanks Wikipedia!). I haven’t tried sideloading a browser, but it should work – probably would be a little painful without a mouse or touchpad, though. isnt as good as a PC web browser but its better than nothing! You can side-load Firefox easily with the PC app adbfire by jocala. It works fine (but you’ll need a keyboard or it’ll be a real pain to use). Amazon aren’t likely to include one as AFTVnews says, so it’s probably your only option. How does the fire tv stick handle audio input? If you mean how do you use voice search on the Fire TV Stick, then you can either buy a voice remote, or use the iOS/Android app. Hopefully I can turn this off completely like with Amazon Echo. Don’t need people in the house using my Echo or Fire TV to purchase things on my account. From what I’ve seen digging around in the code, it looks like enabling parental controls and requiring a PIN for purchases may be your only option. You may also be able to prevent purchases by changing your 1-click settings on Amazon’s side too, since it appears it requires 1-click to be setup to buy anything. That’s pretty disappointing. Might have to unplug the Fire TV until Amazon allows me to disable it all together like the Echo. Called this awhile back. They want a store in every living room. Kinda shocked it took so long. And yes pin protect is the only way. If you got little kids its a must but a pain to input that every time I want to access an app. Amazon’s good with waiving accidental purchases but probably make a ton of money off them. One click buy is here to stay. Good reporting as always. You can’t trust random people on the internet when they say they have an anonymous source but you’ve proven to have reliable sources at amazon plus you’ve done a good job at digging into source code. I see the sorting for apps is already active and is a useful addition. While not a huge feature for me it does add some uniqueness to the fire tv over other android tv devices and might be nice to see a video for a game or electronic device and then immediately do a voice search and buy that product. While adding sorting and favorites are nice there are still some UI changed I’d like to see and some things that still don’t make sense. I only recently saw there was a recent watched tv and recent movies section but one is on top of the screen and one is on bottom. I’m not sure if sorting works or is going to work for your watchlist but would be cool to have switch between content available on amazon prime and content available elsewhere. Games have their own section but apps are still lumped in with games.